Sail the magnificent Nile River between Luxor and Aswan and discover the ancient wonders of Egypt on board one of our 5 star luxurious ships, the M/S Jamila. Guests will enjoy many amenities onboard among them a swimming pool, bar, sun deck, and a restaurant. 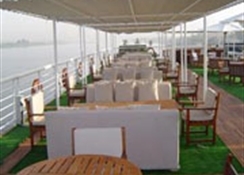 The M/S Jamila consists of a main deck, 2 upper decks and a lower deck. Itâ? ?s 4 suites (35sq m each) and 66 double cabins (22 sq m each) provide guests with the necessary conveniences such private bath/shower, satellite TV, and DVD films, . 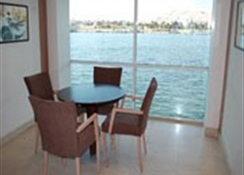 Guests can feel safe as the ship boasts fire alarms, smoke detectors, and closed circuit video.ItineraryDay 1 Luxor (Nile Cruise)Meet and assist at the Luxor airport. Please look for the Meeting Point Egypt representative as they will assist you through immigration and other formalities, and transfer you to the ship for embarkation. The friendly crew will welcome you and assist you in settling in your cabin. Overnight stay on board in Luxor. .Day 2 Luxor (Nile Cruise). Our first day of excursions begins with an early morning trip to the East Bank of Luxor to visit the Karnak Temple and Luxor Temple. Lunch on the cruise. Noon time sailing to Edfu. Dinner and overnight on board in Edfu.Day 3 Nile Cruise Early sailing around 9 AM to the town of Kom Ombo with an afternoon visit at 16:00 to the Sobek Temple. We continue are sail to Aswan and arrive around 21:00. Dinner and overnight on board in Aswan.Day 4 Nile Cruise. Our visit of Aswan begins early morning with a visit to the High Dam, Philea Temple, and Felucca Trip on the Nile. Guests can use the afternoon to leisurely explore Aswan or our (optional) excursion to the Nubian Village or simply ride on a camel along the Nile by our guide on the spot. Overnight on board in Aswan .Day 5 Nile Cruise. Guests can relax in the morning taking a dip in the ships swimming pool and enjoy the Egyptian sun on the sun deck or guests have the option to visit the famous temple of Abu Simbel in the south of Aswan. Early afternoon, around 14:00, we leave Aswan and begin our sail back north with and arrival around 21:00 in Edfu. Overnight on board in Edfu.Day 6 Nile Cruise. In the morning we sail and arrive in Esna around 10:00 where we visit the Temple of Khnum. 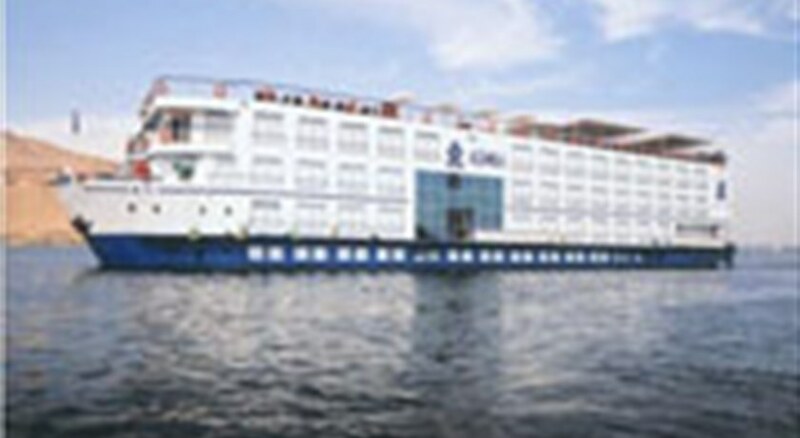 Our cruise continues to Luxor with an arrival approximately at 14:30. Afternoon guests have the option of taking a city tour to heart of Luxor. Overnight on board in Luxor .Day 7 Nile Cruise. Our 7th day will take us to the West Bank of the Nile where we will visit the Valley of the Kings, Hatschpust Temple and the Colossi of Memnon. In the evening guests have the option to enjoy a sound and light show at Karnak temple. Dinner and overnight on board in Luxor.Day 8 Nile Cruise. Breakfast on the cruise and transfer to Luxor Airport for your flight home or your next destination. 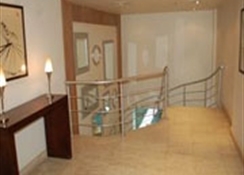 Possible extension at beach hotel in Hurghada or Marsa Alam. Full Sightseeing Package Includes: (official price on the spot 140 sterling): Sight entrance fees for the included sights only as following : - Karnak temple - Luxor temple - Valley of the kings - Hatshepsut - Colossi of Memnon - Kom Ombo temple - Temple in Esna - Philae temple - High dam - Felucca trip in Aswan on the Nile. - English speaking tour guide (Egyptologist) at all tours. - All ground transportation by modern A/C vehicles. Light Sightseeing Package Includes (not bookable on the spot):Sight entrance fees for the included sights only as following : - Karnak temple - Luxor temple - Kom Ombo temple - Khnum temple in Esna - Philae temple - high dam - and Felucca trip in Aswan on the Nile - English speaking tour guide (Egyptologist) at all tours. - All ground transportation by modern A/C vehicles. (Valley of the kings,Hatshepsut, Colossi of Memnon are excluded). Package Excludes: - Egypt Entry visa payable on the spot at the airport for 20 sterling. - Sound and light shows. - Optional tours as indicated in the above program. - Personal expenses. - Tips to be paid on the spot at the amount of 27 sterling per stay (covering porters at airport, all ship staff and all drivers etc). Remark : The sequence and the timing of the above itinerary might change due to navigation circumstances but all included sights will be provided in all cases . Please note: On your arrival day you get the All-Inclusive-bracelet from the reception. We kindly ask you to wear it visible on your wrist during your whole stay. You will be asked to sign a check for beverage orders and other consumptions within the all-inclusive program. Please note that the items on the check will have a price of Zero The all inclusive privileges are from 10:00 am till 10:00 pm. Consumptions before 10 am and after 10 pm will be charged according to the hotel price lists. You are entitled to have two small bottles of water upon arrival from the mini bar, other items will be charged to your room bill according to the mini bar price list. Our â? 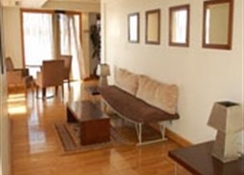 ?Orangerieâ? Main Restaurant is included in the all-inclusive. 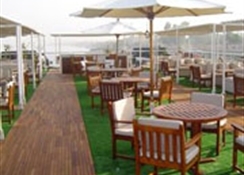 Our Sun Deck Bar is included in the all-inclusive. Please note that bookings made for travel in July and August will be allocated to the M-S Emilio whose departure dates are Monday and Sunday.